Much has been whispered about this game, but very few people have actually seen one. 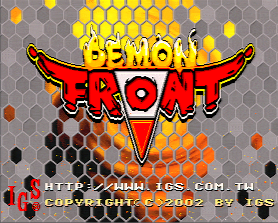 Released by IGS, a relatively unknown company, for their PolyGame Master (PGM) system, Demon Front is a visual treat. At this point unemulated, most people's experience with this software is limited to brief glimpses in overseas arcades and second hand reports and screenshots gleaned from webpages. But what's it like? 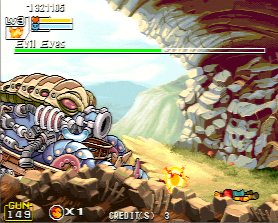 At first glance, you're going to be excused for thinking it's a Metal Slug ripoff. 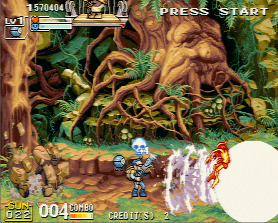 In fact, your second through fifteenth glances are likely to tell you the same thing, and it's true - the game bears a striking resemblence to the amazing SNK/Nazca Metal Slug. 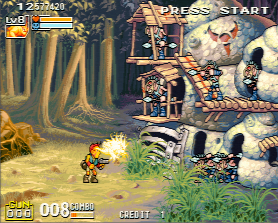 I've been asked if this was a graphic hack on the Metal Slug game, it's so similar (It's not). Choosing to imitate such a well loved game is a sure way to make your job harder, and most reviews I've seen include the phrase "Not as good as Metal Slug." I'll bottom-line it for you early: It's not as good as Metal Slug. In much the same way that imitaters could copy the motion of a Disney cartoon, but never capture the magic, Demon Front never quite manages to equal the appeal and sheer magnetism of Metal Slug. It does a very good job, and attempts to differentiate itself with the same weap... er, similar backgr... I mean cloned boss chara... Well they added pets for each of the four player characters, how's that? 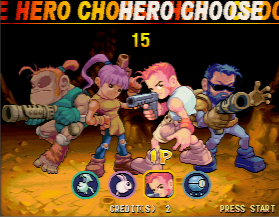 This adds a very interesting dynamic to the equation, which is good 'cause otherwise it's a Metal Slug clone. There are three buttons: Shoot, jump, and shield. Holding the shoot button charges your pet, and when released the pet launches a stationary devastating attack for a few seconds, leaving you free to deal damage somewhere else. This comes in very handy when you, say, shoot some grunts while the pet blocks fire and deals damage to a boss. The shield button converts the pet into a shield that is permament - until you press the button again or it takes enough damage to disappear. Melee attacks and pet attacks release hearts which boost your shield power. 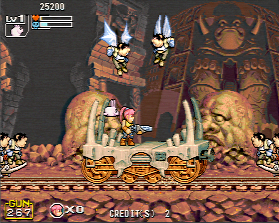 The game is very very long, each of the first five stages has three or four segments, and each has a miniboss that needs to be defeated. It's a serious quarter eater, with dozens of baddies onscreen most of the time. The ability to have your pet attack for you, or act as a shield, makes this frenetic platformer a lot easier to deal with (Or it might if I ever remembered to use it!). The control is dead on, the graphics luscious, and the sound adequate (but not at all spectacular or memorable). 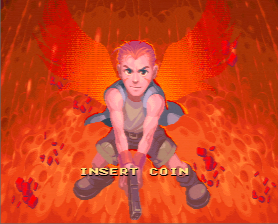 They say Metal Slug 4 sucked, so if you've got a few hundred dollars burning a hole in your pocket give Demon Front a shot - it just might fill that void. 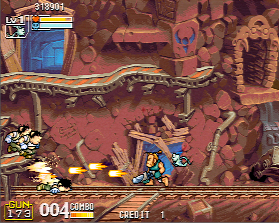 And if the rumours of the next Metal Slug being in 3D are true, this might definitely be a better spend for your cash. See below for nearly 50 screenshots and pics of the hardware!